Watching the new Netflix interactive reality show You vs. Wild feels a little like being stuck in an abandoned mine with a poorly lit torch made from your own underwear. The stakes feel high. It’s hard to say how you came to be in this position, and it’s even harder to know what the consequences might be now. It’s such a bafflingly absurd place to find oneself. Do you make your next decision based on common sense? Do you chuck it all, lean into the absurdity, and just do whatever seems silliest? It’s unlikely that real life could ever have put you in this situation, trapped as you are in the ever-darkening mine, the guttering light from your cotton underpants torch slowly dimming, the distant sound of wind howling past the mine’s entrance. That dizzying surreality makes you feel disconnected from the usual order of cause and effect. If no sensible cause got you here, who’s to say what the effect of your actions might be now? How much of this could possibly be real? How much of it is a fantasy? What happens when your underwear torch goes out?! The premise of You vs. Wild is that Bear Grylls — the Man vs. Wild guy, the adventure survivalist, the drinker of his own piss — has once again been dropped in unpleasant wildernesses and left to survive for some period of time. But there are a few notable twists. One is that in several of the episodes, Grylls is tasked with some mission, some additional framework to keep him bushwhacking and vine-swinging moving toward an ostensible goal. The other, more important twist is that You vs. Wild is interactive. On the heels of the Black Mirror installment Bandersnatch, it is the next major release in Netflix’s branch of programming that asks viewers (players?) to participate in the story. The sense of strangeness, the weird discombobulation of somehow finding yourself in a pitch-black mine carrying a badly designed underwear torch, comes from the slippery, shifting relationship between Grylls’s predicaments and watching someone in actual peril. In some moments things do look quite dire. When faced with an expanse of ice over a frozen lake, Grylls asked me (the viewer/mouse-clicker) whether he should walk across it or army-crawl the whole way. When I chose incorrectly, he fell through the ice and then lay there, partly draped over the frozen lip of the ice sheet, explaining how bad this was. “Now I’m in danger of total body shutdown,” he said, matter-of-factly, after hauling his sopping, steaming body out of the icy abyss. He did not complete his mission, which was to rescue an adorable Saint Bernard named Dana who’d gotten lost in the midst of a search-and-rescue effort. Grylls called for a helicopter to lift him out. Then the episode ended, and Grylls’s strangely upbeat voice-over arrived. “You’ve learned a valuable lesson, but we can never give up,” he said. A “replay episode” option popped onto the screen. I replayed (rewatched?) it again, and this time I selected the army-crawl option. Grylls made it across the lake, and then rappelled down an icy cliff, and was finally greeted by a giant, cheerful, whuffing dog who, to my eye, did not look like she’d been abandoned in a frosty wilderness for 36 hours. But what do I know? She was very cute, and Bear Grylls saved her eventually. He probably would’ve died from hypothermia after falling through the ice the first time around, but this is underpants-torch-mine land, not reality. The consequences for everything are both intense and meaningless. I think I killed Bear Grylls four times over the series’s eight episodes — or I would’ve, if those stories had been allowed to continue through to their natural conclusion, but Grylls always calls a helicopter to come save him. I poisoned him twice with things he should not have eaten, and he and I knew things had gone badly when he doubled over in pain and began groaning. (“Stomach rumbles,” read the closed-captioning.) He vomited noisily into a field before radioing for help. And although the top level of my mind was aghast and regretful that I’d told him to eat those raw bird eggs, which Grylls and I both knew were suspect, my immediate next thought was, Is this real? Surely it cannot have been real. Surely the producers did not watch while this grizzled British dude crunched down on unknowable, raw, brown speckled bird eggs, and surely they did not medevac him out of the wilderness while he recovered from salmonella, and then dropped him right back in the same spot a few days later to try out eating gorse flowers instead? The problem with You vs. Wild is that it’s such an irreconcilable mishmash of reality and fiction that it feels like it escapes both categories and becomes something else entirely. By making it seem more “real,” by giving viewers (data-producing subjects?) the opportunity to participate in the “real” choice of what comes next, You vs. Wild just seems faker. Your eye is drawn even more irrevocably toward the artifice. It is a curated and mediated experience of “reality” that invites you to participate even while it guides your choices safely away from anything truly threatening or disastrous. You vs. Wild is to wilderness survival as the Museum of Ice Cream is to museums. It is survival-themed. It is an elaborate facsimile of something that knowingly winks at its own falseness, and then spits you out the other end with a funny screenshot to commemorate the ride. 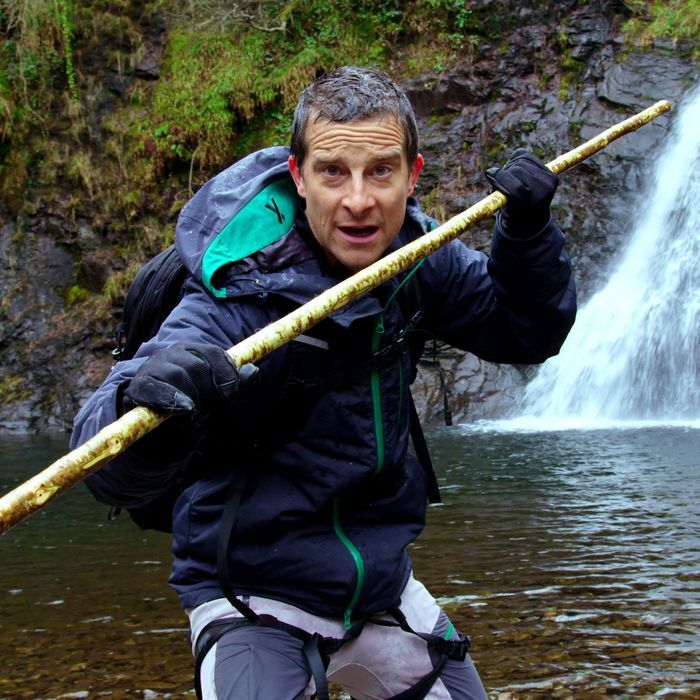 It’s hard to know the right yardstick with which to measure You vs. Wild’s success. It is not a very good game, neither difficult nor surprising, and its mechanics are so simple that I’m not sure game is even the right term. Nor is it a very good show; it’s the opposite of engrossing, instead leading you to constantly wonder how much of it is produced and whether the wolf Grylls “fights” is actually anything close to a “wolf.” But to say that it is simply “not very good” doesn’t feel right either. Because when Grylls was, shockingly and yet somehow inevitably, trapped in an abandoned mine carrying a torch made out of his own underwear, a thing he did at my (the viewer-player) behest, I can’t say I wasn’t entertained. I was. If I was also confused and alarmed and thrown into a small existential crisis about the nature of reality, I guess those feelings were a bonus.